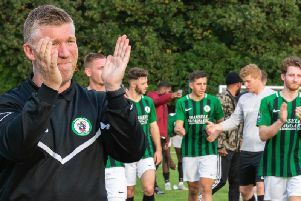 Haywards Heath Town manager Shaun Saunders expressed his delight after his team’s 2-1 victory over Whitstable Town on Saturday, highlighting the ‘first class’ attitude of his players. With six players out of action or unavailable for the game, Saunders’ squad depth was greatly tested. He said: “If I said we were down to the bare bones, it’d be an understatement. It was a real, real team effort, it was fantastic. Their attitude was first class. The Blues boss is looking forward to the upcoming home fixture against Sevenoaks on Saturday. Saunders expects to select from a much strengthened squad with Josh Heyburn, Nathan Cooper, Sean Roddy, Trevor McCreadie, Alusine Bangura and Tyrese Gray-Branford all returning from absences, while Josh Spinks is a doubt after playing through injury against Whitstable Town.